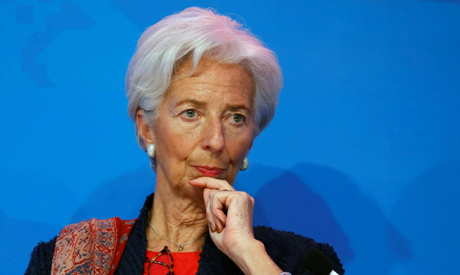 International Monetary Fund Managing Director Christine Lagarde says Egypt’s economy has continued to show strong growth, with unemployment falling to its lowest levels since the 2011 popular revolution. The remarks came following Lagarde’s meeting with President Abdel Fattah El-Sisi in Washington DC on Tuesday in which the pair discussed progress under Egypt’s economic reforms backed by a three-year, $12 billion loan program with the IMF. “The economy continues to grow robustly, unemployment is at its lowest level since 2011, foreign exchange reserves are at comfortable levels, and public debt is on a downward trajectory supported by growth-friendly consolidation efforts,” Lagarde said in a statement published on the IMF's official website following the talks. The loan program, which Lagarde said has progressed well, began in 2016 and is tied to tough reforms including a sharp currency devaluation, deep cuts in energy subsidies and the introduction of a value-added tax. The reforms has strained the budgets of millions of Egyptians. Some $10 billion has already been disbursed under the deal, with a final of six $2 billion tranches due after completing a final review in June. “I reiterated the Fund’s commitment to support Egypt and its people,” she said. During the talks, President Abdel Fattah El-Sisi stressed the importance of continued cooperation with the Fund, saying that the partnership between the two sides “provides a positive environment for all investors and international financial markets” and creates greater investment opportunities, a presidential spokesman said in a statement. The reforms are aimed at reviving the country’s economy and luring back investors following years of political disturbance.